The volume of global corporate high-yield debt issues reached $75.5 billion in the first three months of 2010, breaking all quarterly records, according to Thomson Reuters. The total was up 580% over the first quarter of 2009. With 25 transactions, the materials sector was the most active for high-yield debt issuance in the first quarter. The sector includes mining and metals, chemicals, construction materials and paper products. The financials, industrials and telecommunications sectors also were active. Bank of America Merrill Lynch was the leading bookrunner for global high-yield debt in the first quarter, followed by J.P. Morgan, Citi, Goldman Sachs and Credit Suisse. 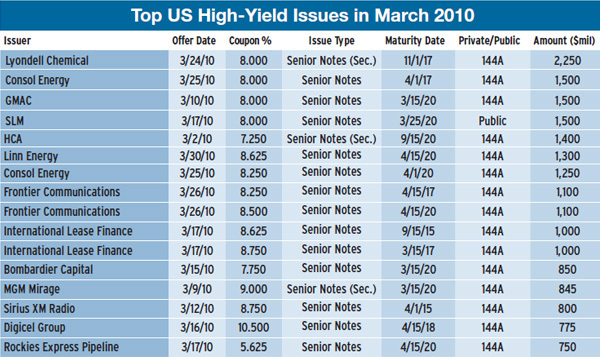 Using a somewhat broader definition, Dealogic put global high-yield bond volume at $93.5 billion in the first quarter of 2010. Overall corporate bond volume fell 32% to $346 billion in the first quarter, it says. The rise in high-yield bond issuance was more than offset by a 47% drop in investment-grade corporate debt issuance, Dealogic says. 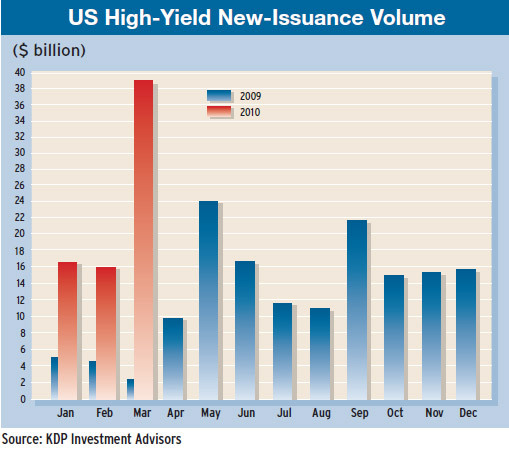 US high-yield new issuance surged to a record $38.5 billion in March from $15.8 billion in February, according to Montpelier, Vermont-based KDP Investment Advisors. The biggest new issue in March was Lyondell Chemical's $2.25 billion of secured senior notes, which helped clear the way for the Houston-based firm's exit from Chapter 11 bankruptcy. Bank of America Merrill Lynch was the lead underwriter for the offering. The proceeds from the sale of the notes, together with a new $1 billion loan and a new European securitization facility, will be used to repay debt. Lyondell said that its plan to reorganize by repaying debt and giving creditors some equity was preferable to accepting a $14.5 billion takeover offer from India-based Reliance Industries. Reader's Digest Association, a magazine and website publisher, emerged from bankruptcy in February with the help of $525 million in exit financing from a high-yield bond issue. 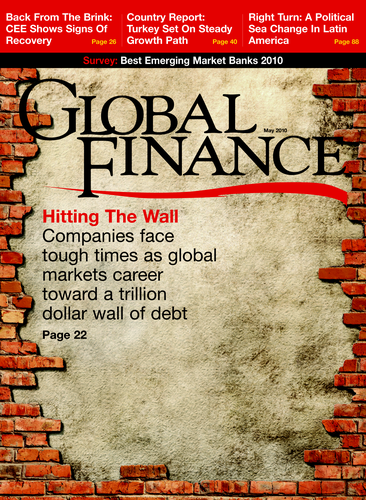 The Lyondell and Reader's Digest issues were the first bond deals for exit financing since 2005, according to Dealogic. US issuers accounted for more than half of global high-yield bond volume in the first quarter, but European issuers also saw a large increase, with $19.3 billion raised, compared with $7.3 billion in the same period a year earlier. Kraft Foods' $9.5 billion debt offering in February was the largest investment-grade corporate bond to price globally in the first quarter of this year, according to Dealogic. The proceeds were used to help finance Kraft's $18.5 billion acquisition of UK-based chocolate maker Cadbury. Novartis, the Switzerland-based pharmaceutical manufacturer, had the largest investment-grade transaction in Europe in the first quarter, with its issuance of $5.1 billion in bonds in conjunction with its acquisition of global eye-care provider Alcon. European sovereign debt capital market issuance in the first quarter was a record $156 billion.